Today on The Star Wars Show, the official inside-look show from Lucasfilm, Marvel Comics revealed what Kieron Gillen's "mystery series" will be when it starts shipping in December. 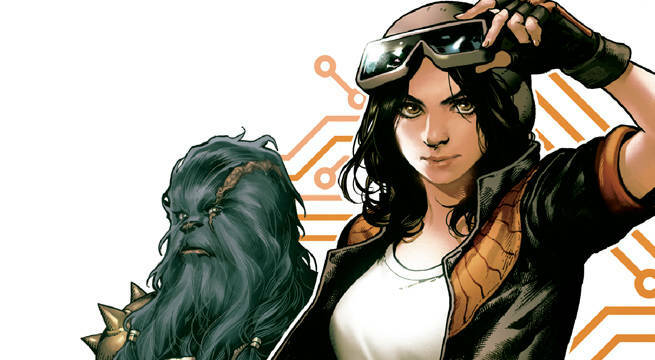 A new ongoing series for Doctor Aphra, the breakout character Gillen co-created in the just concluded Darth Vader series, will kick off this winter. Gillen will be joined by artist Kev Walker on the series, starring Doctor Aphra, as well as the popular "evil Threepio and Artoo" droids, Triple Zero and BeeTee and the Wookiee bounty hunter Black Krrsantan. The series picks up Aphra's story where Darth Vader #25 left off - after she tricked Vader into thinking he killed her (or at least she's pretty sure she did) and escaped his grasp, Aphra will go on her own adventures, returning to a life of exploring new worlds. Gillen's Darth Vader series with artist Salvador Larocca has been incredibly well-received by critics and fans since its inception, with fans loving the dark and clearly dedicated Sith Lord take on the character, returning him to his terrifying beginnings. Vader in the series was ruthless, cold, and calculating, and restoring his place in the Empire's hierarchy after the failure of allowing a young Rebel to destroy the first Death Star. The series introduced a host of new characters, including new bounty hunters, droids, and competing Imperials. None broke out like Doctor Aphra, though, who became an instant fan favorite (and cosplay sensation). Her quick wit (that she managed to match at times even with Sith Lords and Imperial master strategists), strange mix of happy-go-lucky and deeply concerned personality, and willingness to do just about anything to survive, as long as she's having a good time doing it, pulled readers in. When Darth Vader's end was announced, fans feared for the character's life - but now we know she not only lives on, but her story does, too. More details about Star Wars: Doctor Aphra are expected in the coming days, and the series starts shipping in December 2016.